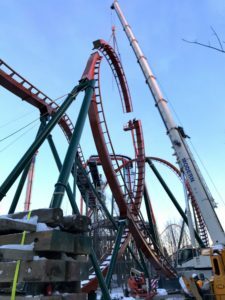 The last piece of roller coaster track for Yukon Striker by Bolliger & Mabillard was just installed at Canada’s Wonderland outside Toronto, marking the completion of what will be the fastest, tallest and longest dive roller coaster in the world. The construction project began in January 2018 with the excavation of Yukon Striker’s underwater tunnel and finished with the last piece of track just installed on the highly anticipated 360º loop. Yukon Striker will dive 90º, 75 meters (246 feet) down, soaring past neighboring coaster Vortex and hitting a top speed of 130 kph (81 mph) through the tunnel. Yukon Striker spans just over 1,100 meters (3,609 feet) in length and consists of 107 track sections which weigh a total of 1,213 metric tonnes (1,337 tons). It requires 42 support columns and will feature floorless trains with stadium-style seating in three rows of eight.